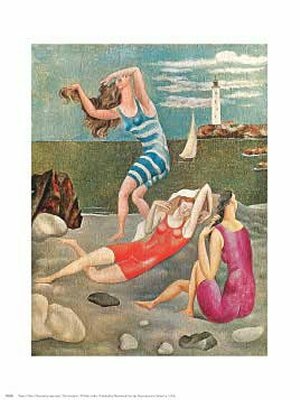 From 1918 on, Picasso spent almost all his summers by the sea. with this a new theme entered his work: bathers. The sinuoius female bodies possess a grace rae in Picasso, and mark the first move towards expressionism through elongation which evokes both Ingres and El Greco and suggests a conflict between their styles.